Made this tonight, and it was delicious, thanks! Favorite yet. Have been looking for that perfect scalloped recipe. Love the use of fresh thyme, garlic, onions and cheeses. I did use half and half, but not really sure would have made difference in taste. I did boil the potato slices for about 5 minutes to get cooking started. Have had trouble in past with potatoes not quite getting done in other recipes. Was able to half recipe easily. I am absolutely terrible at making a roux. What would be the measurement if I have to substitute with cream? Still two cups and minus the flour? 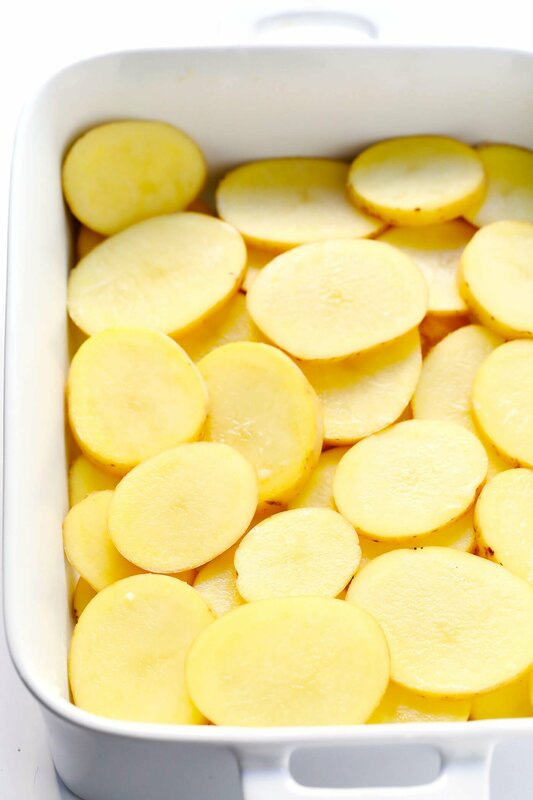 This is the best scalloped potato recipe ever! I’ll never look for another one. Thanks for sharing! And yes to the eight cloves of garlic. These were fantastic. I had just under a pound of potatoes, so I quartered the recipe (or so I thought)- I added the full amount of flour but then had to increase the liquid (to the full amount) to make it creamier and melted the cheese with the sauce and tossed the potatoes in the sauce before adding all to small casserole dish. I guess this resulted in more sauce–but it was great regardless. Hope I can remember my changes in the future. It was amazing. Thanks for the recipe! The recipe that I need to try immediately at home. I can not wait to get started it! I have been using the same recipe for Scalloped Potatoes for nearly 25 years. As a lark I decided to try a new one. What luck that this was the one I tried!! Wow! I am changing to this one for good! Also, I used some of your tips and the texture and flavor of this sauce is amazing! Thank you! 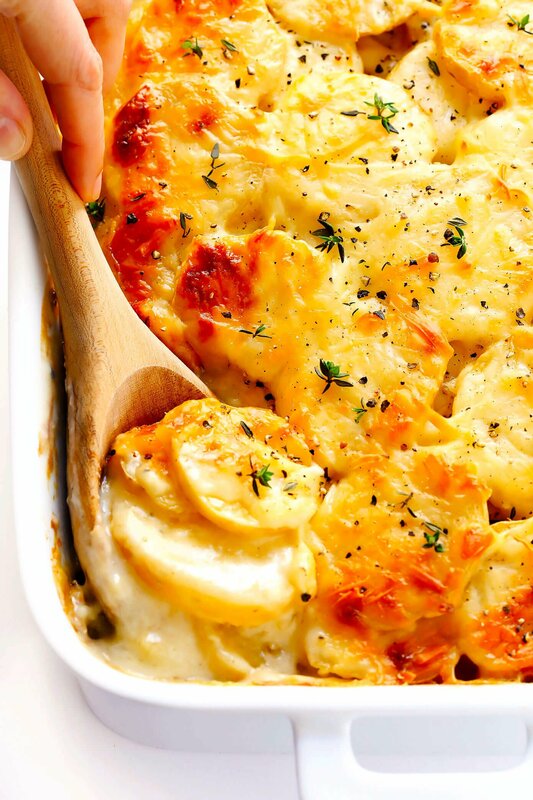 Scalloped potatoes do not have cheese, rather au gratin potatoes have cheese. 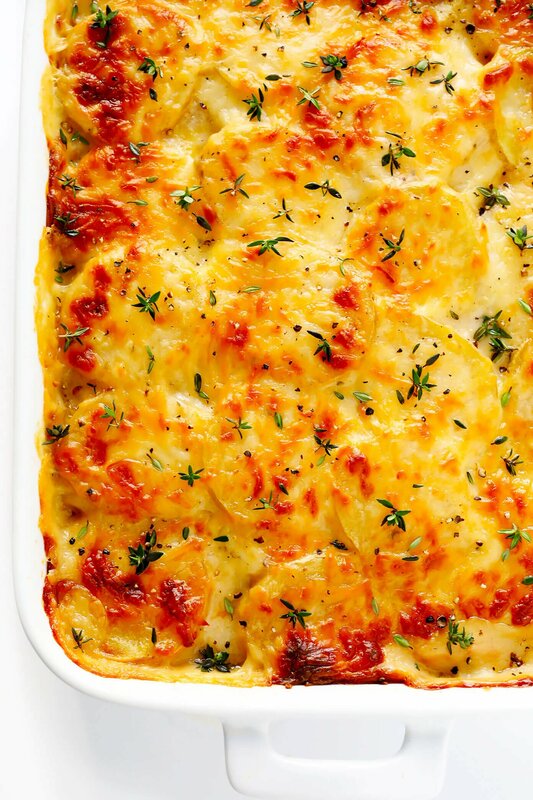 Scalloped potatoes is in a cream sauce, but not a cheesy cream sauce. I am from the south and while true (in the culinary sense of the word) scalloped potatoes do not have cheese in them most of us learned to make them with our mother and/or grandmother. These were true country scalloped potatoes as WE know them and these marvelous country cooks DID put cheese in them. The term au gratin did not exist in their humble vocabulary. I am a gourmet cook of many years who believes in keeping the legacy of these amazing hard working women alive and honoring them. 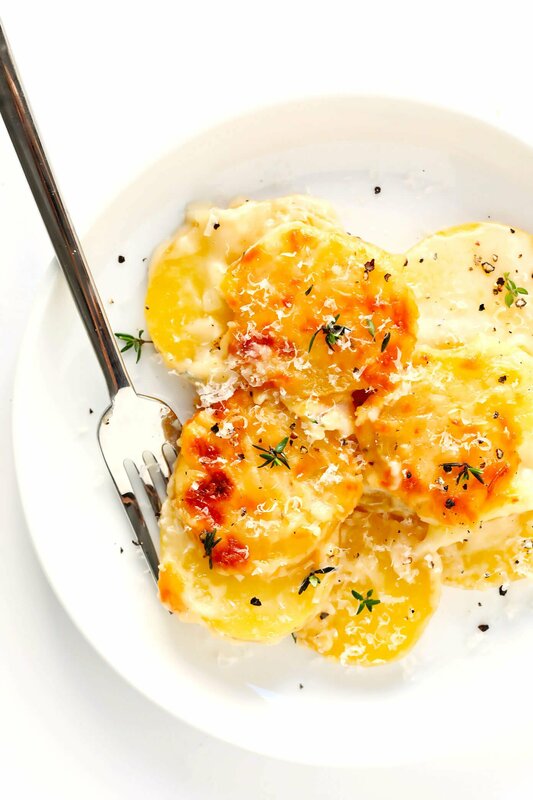 So perhaps there are scalloped potatoes with or without cheese. These were awesome! Best ever! Made this and was excellent! Thanks. Unfortunately, this recipe has very little taste. We made the recipe exactly as described and it did not live up to expectations. Pretty bland. Absolutely delicious. I used 2 percent milk and about 3/4 cup of butter milk (still just the 2 cups “milk” in total. Very dreamy and yummy. Thank you so much! Made this tonight, was easy to prepare and it was very delicious and flavourful! Great recipe, and very easy to follow. It was a big hit with the family. I would leave the onions larger since you strain them out anyways. Very yummy, easy to make and so tasty! New family favorite! These are Devine! I couldn’t even get a picture because they were gone so fast. They were beautiful and delicious. Thank you so much for sharing this wonderful recipe! This recipe was so utterly delicious that my friends and I will be having it for Thanksgiving instead of mashed potatoes. I made a special trip to the grocery store today to buy more potatoes so I can “practice” making it for Thanksgiving, LOL! I am a beginner when it comes to the kitchen! This recipe was easy and so delicious! Thank you! If I use a slightly smaller pan (so the casserole will be a little thicker) do you think it will take longer to bake? Thank you so much!! I made this recipe with red baby potatoes, cooking for one in little banking dish, was almost too cute to eat!! Soooooo good. The only thing I did different was parboil the potatoes for 10 minutes to cut down on the oven time. I did not cover them because they were partially cooked , just baked at 400 degrees for 45 minutes. I can’t believe after making them one way for 40 years I found perfection! Thanks so much for sharing. I made this tonight and halved the recipe for me and my husband. I thought it turned out well. I still used a whole white onion in 3 tsp of butter, but cut everything else in half. It was fabulous and I thought better than the scallop potatoes my mom use to make. 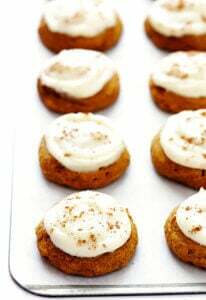 Love this recipe,have made it twice and it’s a big hit in our house!! 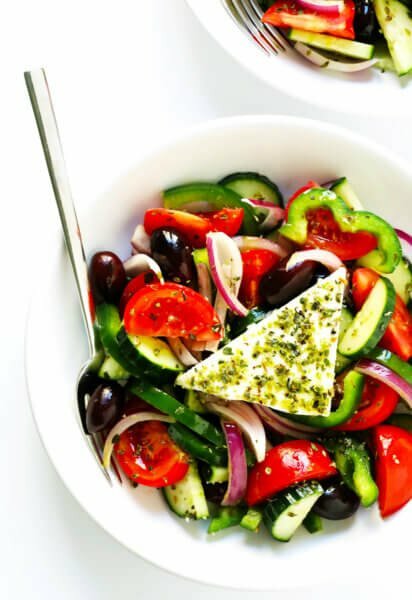 Could I make this and cook the day before and warm the next day? Family was fighting over the left overs. Wonderful recipe. These are SO good. My family loves them. Even though I used fresh rosemary instead of thyme…..by accident. Oops! Thanks for the great recipe! This was really great! I was in a time crunch so I sliced the potatoes and boiled them first for a few minutes until almost tender but still hard enough that they didn’t break. While they boiled I prepared the sauce, grated cheese, etc. I also like a little “tang” and added a tablespoon of Worcestershire Sauce. Baked 30 min. 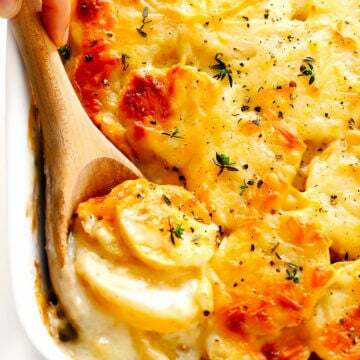 Scalloped potatoes do not include cheese.Au Gratin potatoes include cheese. Am I the only one who was always taught this??? Otherwise sounds like a good recipe. Hi! 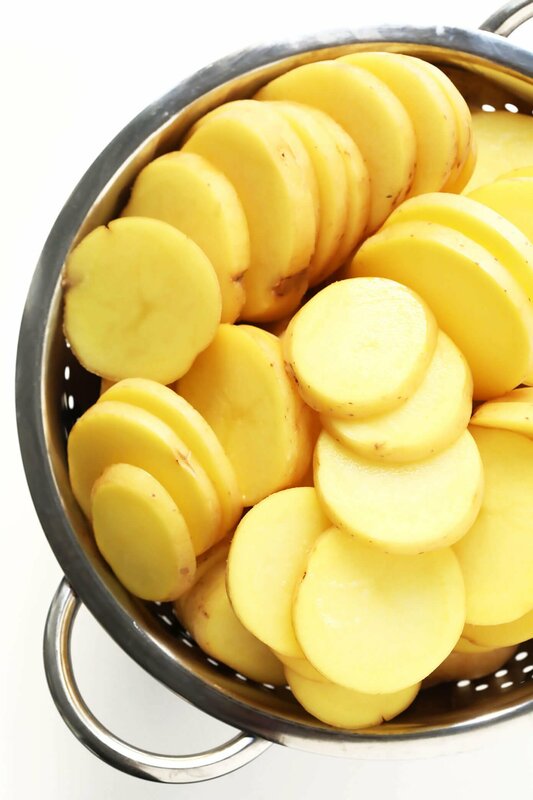 Is Yukon gold same as yellow potatoes? I did use 2 cups stock,and I used 2 cups half and half because I like them creamy :) everyone loved them I will ne making these again next year ! I made these potatoes for our Thanksgiving dinner tonight using edam and sharp cheddar and they were voted MVP of Thanksgiving! My family has requested I make another batch for dinner tomorrow :) Thanks for an awesome recipe!! These look amazing. 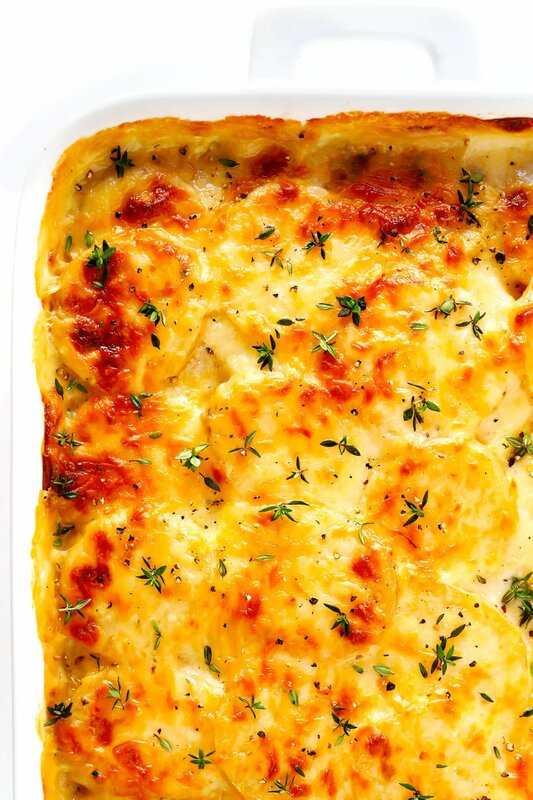 I absolutely love scalloped potatoes but have never done them with out the box. Any chance you know of a lactose free version alternative for the heavy cream? My daughter has an allergy. I have to say that these were/are the best scalloped potatoes that I have ever had. My husband agrees with that! YUM! Thank you. I made this last night – except I did use pre-shredded cheese and I would definitely take the tip and NOT use it. However, the scalloped potatoes turned out very, very good and were quite simple to make. 100% would make again. Just made 3 batches for a Xmas supper in my community. Outstanding recipe and very easy. I used dried onion to cut down the chopping, no thyme but had lots of dill. We loved this recipe. I used about 2-1/2 lbs potatoes and the rest of ingredients as written. What a delicious recipe! I made these scalloped potatoes and there wasn’t any left! My dinner party absolutely loved them! I have another one this week and that is what they asked if I can make! Some of my Instagram followers give it 5 stars and some show the bowing emoji! Thanks for the recipe by far the best! Super flavorful! First time cooking this kind of dish and it turned out great! Hi! Reading your comments about making this ahead, which I would like to do on Christmas Eve. Your make ahead recipe says to “bake and then completely cool”. Then bake again for 30 min the day of serving, which make sense. For the “bake and then completely cool” part, do you bake it twice (covered and then uncovered) as the original recipe directs, or just once? Thanks! I have made this recipe a couple of holiday dinners and I love it. However, this year, I am very short on oven space. 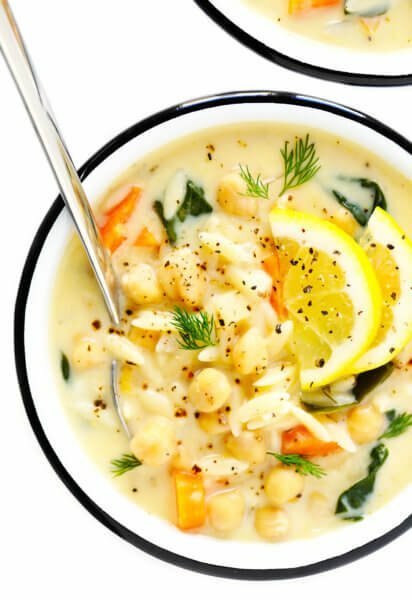 Do you think it’s possible to make in the slow cooker with the same result? Maybe broil in oven before serving?